The stiffness of bone plate is most important as it strengthens the bone by providing shield till the bone heals and regains its original strength. Materials used in designing bone plates are Titanium and Stainless Steel. Both material are strong so required strength is provided to the bone and there is no reaction caused in the body. Why to choose HCM Orthocare? 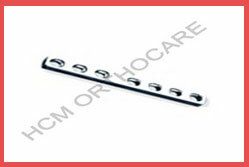 We use high tech CNC machines and raw material which makes our Bone Plates unmatchable. High tech machineries are helpful in manufacturing so precise length and diameter is maintained. We also make sure that this implants are non-toxic so there is no reaction like inflammation in the body. High quality raw material are used, which matches international standards.